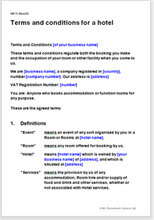 Booking terms and conditions for a hotel or resort of any rating. The document may be posted on the hotel's website (and accepted by including a tick box), or used as a print out and signed by the guest on arrival - you choose. Includes many provisions to protect the hotel from damage caused by fast-slowing guests whilst remaining fair to the guest at all times. This is a comprehensive terms and conditions document for any sort and size of hotel or resort, of any caliber or rating. The document could either be posted on the hostel’s website (and accepted using a tick box) or be presented to the guest upon arrival. It is fair to both parties, yet ensures that the hotel is protected from damage by it’s guests and guest’s visitors. It includes a strict no liability paragraph to protect the hotel and also includes provisions regarding what happens on arrival, provision of food (where applicable), no smoking and other provisions which will ensure a smooth stay for both parties. It is especially useful because it is written in plain English and therefore will be easily understood by anyone who reads and understands basic English. Explanatory notes to guide you through.